Some small but awesome news: The Meek made it onto the AV Club’s Best Comics of 2016 list! TM has been around forever, and has collected a handful of nice reviews, but I don’t think I’ve ever made it onto a list before, and certainly not a legit one like this! haha… anyways it was a really nice surprise, and I’m in some wonderful company it looks like. Great news you made the list–there are so many works there I don’t know and so many that look very gripping and amazing in art. I see you are in great company, and rightly so!! Wonder if the still unidentified assasins who murdered the empress reached their goals with spiralling the emporor into madness and the realm into war? The Tiger’s enough to drive anyone into madness. And I suspect Luca wasn’t much sane to begin with. What if Tiger killed the empress? Suppose he is fed by chaos, war, and suffering? That would explain why he takes the form of a predator, while his opponent takes the form of a more passive creature. Yeees, tasty war and deliiiicous suffering. In my head, Tiger sounds like Dexter from Dexter’s lab. I have almost no doubt that he (it?) did. Luca looks… different. Face too, but proportions mostly, looks like his head shrinked, especially on the last frame. His head is tilted up at an angle for the last one + weak chin, it looks weird XD But yeah, I’m drawing him with a different (I hesitate to say better) style now since I’ve learned and unlearned a few things since Chapter 2. I’m worried for the proportion between the width of the head and the width of the shoulders (on the last frame). He had a feeling of a little angry man before in Ch2, but a “low-but-not-little” very broad-shouldered man now. Maybe it’s just this frame. I have the hilarious mental image of Luca requesting that his tailor put extra-large shoulders on all of his jackets for the exact reason that it makes him feel like a Big And Manly Emperor, and then angrily denying it whenever somebody makes a comment. THAT IS IT! I HAVE HAD IT WITH THESE KAK VERUHET CARISSI ON THIS DZARLAT OCEAN! I’ve been watching Star Wars so much that all I could hear as Luca’s voice was Grand Admiral Thrawn with that dialogue. Poor Captain… He asked for it though. I do think that’s it tbh XD Public numbers tends to make people notice… personally I think my work on MI was much stronger this year, but I am definitely grateful for any press! I’ve always dreamed of being able to say “my ocean”. I forgot how much I loved Luca’s expressions. He’s like a walking, talking reaction image hoard. Do you want your head microwaved, captain? Because this is how you get your head microwaved. I have been trying to figure this out. Is this captain The Captain of this boat, or is he a harbor master? Is Luca accusing him of falsifying his own log, or that he is incompetent or deceitful in checking ship records of boats coming into this harbor? I was under the impression it was his ship until I read your comment, and now I’m genuinely not sure! Harbor master would make more sense here, since I believe they’re usually the ones in charge of logs like these. Though in that case this would be more a problem of oversight rather than deceit, not realising the port was inoperational… Unless he intentionally let the ship through anyway. Huh. 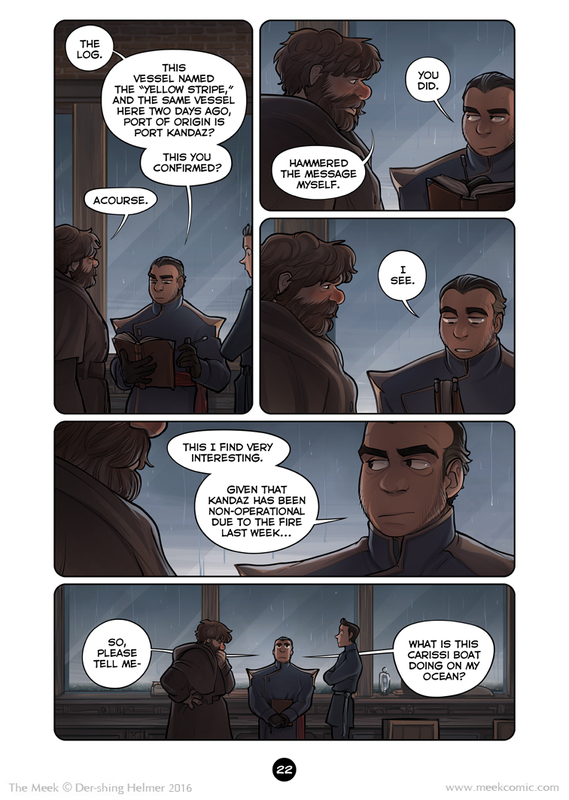 I would love this comic if I actually understand whats going on. Yeah, chapters like this require not being posted slowly over the course of months but: webcomics. *Your* ocean? Luca, you are such an emperor sometimes. Sheesh.